For 14 years Jason Vargas has made a living by dangling raw cuts of chicken breast in front of massive crocodiles. 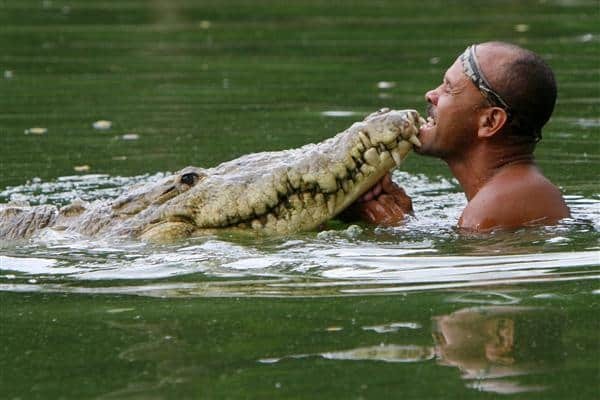 As the main tour guide for Crocodile Man Tours, based at the Tárcoles River, Vargas usually spends his workdays wading barefoot down the river’s banks, putting himself within inches of the beasts’ deadly maws for the amusement of tourists. Born and raised near the Tárcoles, in the country’s Central Pacific, Vargas’ unusual career path has roots tracing back to a childhood fascination with the giant reptiles. Vargas’ death-defying antics have turned him into a celebrity. He has been the subject of news stories, a French documentary and an episode of Animal Planet. But his success came to a screeching halt in May when officials from Costa Rica’s National System of Conservation Areas (SINAC) held a meeting and told all Tárcoles tour operators to stop feeding the crocodiles. But Vargas’ tour woes are of little concern to SINAC, which says operations like his make crocodiles more aggressive, and have spurred a sea of other croc-related complaints from the rest of the tourism sector. In the past year, crocodiles have lounged on beaches, attacked surfers, closed down national park entrances and eaten a man alive. The mounting number of incidents has sparked public concern, and members of the tourism industry are now asking for a crocodile intervention. Though Environment Ministry officials have appointed a task force to assess the state of the crocodile population, they say it may be the tourism industry, not the crocodiles, that needs to change. The Tárcoles River is among the most polluted waterways in all of Central America. Full of trash and teeming with crocodiles, the river is hardly an appealing place for a swim. But for one reason or another, the murky waters managed to tempt Omar de Jesús Jirón, a 32-year-old Nicaraguan man who drunkenly attempted a swim near the Tárcoles’ main bridge on April 29 of this year. Police and Red Cross responders still dispute the exact details of why and how Jirón entered the water that evening, but one thing is certain: He never came back. After swimming for several meters, Jirón was nabbed by a group of the river’s crocs. Unable to pull Jirón from the reptiles’ jaws, witnesses watched helplessly as the crocs ripped the man apart. Several days later a woman on a walk near the river’s edge discovered the only part of Jirón police were ever able to recover, his head. The horror of Jirón’s death captivated Costa Ricans for weeks, and drew attention to the river’s unusually aggressive American Crocodiles. Though crocodile attacks are not statistically common, the reptiles still sit among the top 10 most deadly animals in the world. According to the International Union for the Conservation of Nature’s crocodile specialist group, there have been 1,159 reported crocodile attacks on humans since 2010, and many other attacks go unreported. The Nile crocodile and the saltwater crocodile are responsible for nearly all of these attacks, neither of which can be found on the American continents. Though country-by-country comparisons of crocodile aggression can be misleading due to inconsistencies in reporting, the number of recorded attacks in Costa Rica is significantly higher than most in the region. According to CrocBITE, a worldwide crocodilian attack database that reports attacks from as far back as 1816, only the much larger American crocodile populations in the U.S. and Brazil outstrip Costa Rica’s in terms of aggression. Other than those two countries, in the Western Hemisphere, Costa Rica has seen more fatalities and more than double the amount of attacks than any other nation. Five of these attacks occurred in the past year. In rural parts of the Caribbean Coast, a 14-year-old girl lost her leg to a croc, and another crocodile pulled a 65-year-old man from his rowboat and killed him. But these types of attacks have always been common. According to Bolaños, crocodile attacks in communities near rivers used to be a common occurrence; the media just never reported them. Both Bolaños and MINAE say that any seeming growth in the number of crocodile attacks is due to better reporting rather than an actual increase. Attacks near beaches and tourist hotspots, however, are increasing. In February, a man nearly had his legs ripped off by a croc in a river near the popular Pacific surf beach Tivives, and a Spanish surfer was attacked in the ocean near the northwestern party hub of Tamarindo. The spot where Jirón was attacked, the Tárcoles River, has more than 100,000 tourists a year who stop off at the bridge to gawk at the crocodiles, according to local business owners. Earlier this month, the Chamber of Hotel Owners sent out an open letter to members of the government asking for controls on the crocodile population. In the letter, the chamber’s president, Gustavo Araya, wrote that tourists were getting scared of the high numbers of crocodiles near beaches, and asked that MINAE take action. The letter noted that in the case of overpopulation, MINAE officials can legally kill or relocate crocodiles. While owners of tourism businesses complain of the lack of croc protection from MINAE, ministry officials claim that tour operators are part of the problem. As the country develops, crocodiles’ traditional habitat has come under threat from agriculture, human settlements and, most recently, eco-tourism. Tourists who visit Costa Rica no longer stick to the well-treaded beaches and volcanoes that made the country famous, but also explore the lesser-traveled corners of the country that used to harbor wildlife. But some tours go beyond just entering croc territory. According to experts, crocodile feeding tours like Vargas’ Crocodile Man Tours actually change the way crocodiles perceive humans. Costa Rica has a long-standing law that prohibits feeding crocodiles, but MINAE officials tolerated the Tárcoles tours for years because they were not perceived as a threat. After the recent attacks on tourists, MINAE decided it was time to enforce the regulations. They gathered the area’s tour operators, explained the law and told them if they did not conform they would be fined. According to Adrian Arce, MINAE’s director of wildlife for the Tárcoles region, not all of the tour operators have been cooperating. To Vargas, it is not the tours that are causing a problem, but the dozens – if not hundreds – of other tourists who visit the Tárcoles bridge every day. A quick search of “Tárcoles River” on YouTube, confirms Vargas’ claims. Coming from all corners of the world, camera-touting tourists have saturated the Internet with videos of near misses with the river’s massive reptiles. Some of the bridge’s visitors drop meat from above to watch the crocs fight, while the truly courageous (read: stupid) will approach the riverbank and stand face-to-face with one of the river’s massive beasts. Surprising to most crocodile experts, Jirón’s accident was the first crocodile attack on the Tárcoles since 1995, but officials say if the indiscriminate feeding continues it’s only a matter of time before a tourist is taken out. 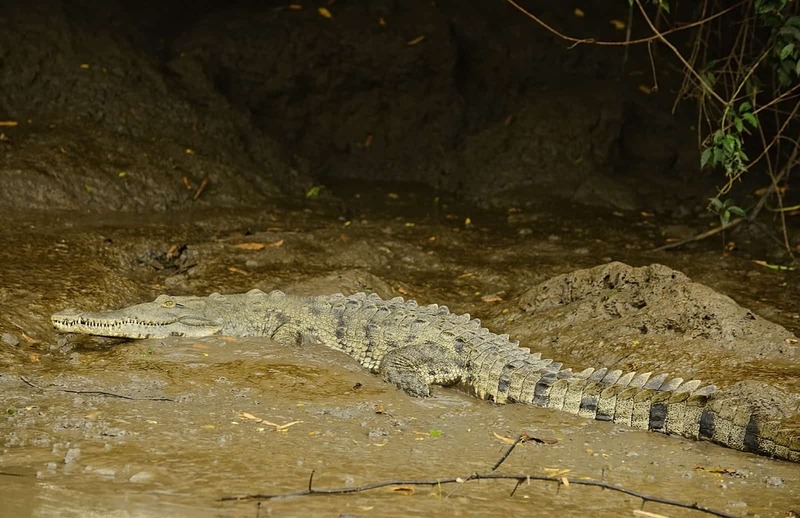 Though wildlife experts point to tourism as the probable cause for the crocodiles’ aggression, they remain unsure if overpopulation is also a contributing factor. MINAE has had to address crocodile overpopulation before — just last month, SINAC officials killed 80 crocodiles in the Tempisque River, in the country’s northwest, to lower the population before breeding season — but a lack of resources has prevented the organization from studying most of the country’s rivers. The Tárcoles has not had a comprehensive population study for six years. For now, MINAE is managing the problem with a special crocodile task force charged with creating education programs and conducting population studies when funding is available. But crocodile experts say that the only real solution is to develop a comprehensive management system for all of the country’s rivers. This would require population studies of all of the country’s rivers and personnel to continually monitor the animals. Those studies require money, money that the universally disliked crocodile has never been able to attract.